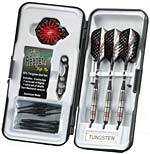 This 90% tungsten dart was designed to fit Top Player's requests. Features a slim barrel and distinct grip-points. Front tapered for frewer deflections.